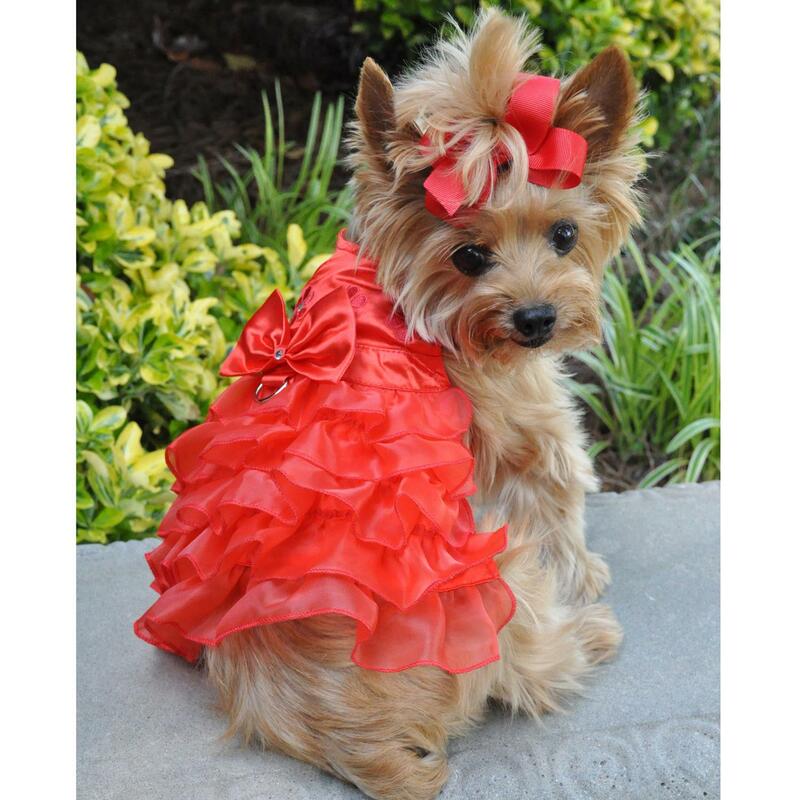 Give your dog a glamorous look in this Red Satin Holiday Dog Harness Dress by Doggie Design! 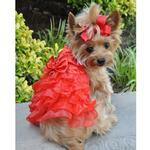 Your dog will be a lovely lady in red with elegant Holiday Dog Harness Dress by Doggie Design in Red Satin. This classic red satin dress features embroidered flowers on the bodice with rhinestone centers. The waistband is topped with a beautiful red satin bow with a rhinestone accent. A D-ring lies beneath to instantly transform this elegant party dress into a walking harness. The included matching leash means every occasion will feel like a red carpet event. This dreamy dog dress has a tiered multi-layered chiffon skirt with delicate lettuce edging. The waistband is topped with a beautiful red satin bow with a rhinestone accent. A D-ring lies beneath to instantly transform this elegant party dress into a walking harness. The included matching leash means every occasion will feel like a red carpet event. This dreamy dog dress also has a tiered multi-layered chiffon skirt with delicate lettuce edging. Despite its extravagant appearance, this dog dress is easy to apply with touch fastener at the neck and chest so your pup will be ready for a party in an instant. Ideal for Christmas, Valentine's Day, or any festive occasion, your pup will love all the attention she gets while wearing this beautiful red dog dress. Holiday Dog Harness Dress by Doggie Design - Red Satin Customer Photos - Send us your photo! Miss Molly is a 3 year old Cavalier King Charles Spaniel, and loves to wear dresses! She is wearing this red Doggie Design dress, size Large, purchased from Baxter Boo! Posted On 03/03/19 by Kelly S from Lancaster , OH Yes, Kelly S recommends this product! This was a gift from my mom. She got this for my Shih Tzu to wear for next X-Mas or whatever holiday we choose. She has a 16” chest and wears a medium. The ruffles and satin make this dress look fancy and expensive. I don’t think you’ll be disappointed. I got this dress as a gift for my baby from my mom. It’s nicely made and very cute. A medium fit my 10.5 lb Shih Tzu. She looks so pretty in her red satin holiday dress. This is another winner. Dress your girl in this soft and fitting dress. So good for any season and Valentines Day is just around the corner. Posted On 03/20/18 by Jacqueline S from , PA Yes, Jacqueline S recommends this product! Waited a while to get this and it looks lovely on my little Maltese! Posted On 11/22/17 by Grace G from Albuquerque, NM Yes, Grace G recommends this product! Bought this dress for my granddog and she loves it! Fit her perfect and she looked gorgeous. Posted On 10/26/17 by Peggy Nieves from Carlisle, PA Yes, Peggy Nieves recommends this product! We absolouly LOVE this Dress Set it is EVERYTHING we wanted and more ! PERFECT FIT ! LILLY KNOWS SHE IS BEAUTIFUL IN IT, SHE REALLY STRUTTS HER STUFF ! Thank You !